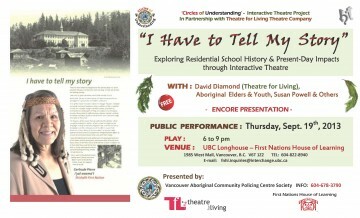 The Residential School Awareness Project Circles of Understanding in collaboration with Theatre for Living organized a power play (a day theatre workshop culminating in an audience-interactive public performance) last April. The project explored the impact of the Residential School system on Aboriginal communities today. 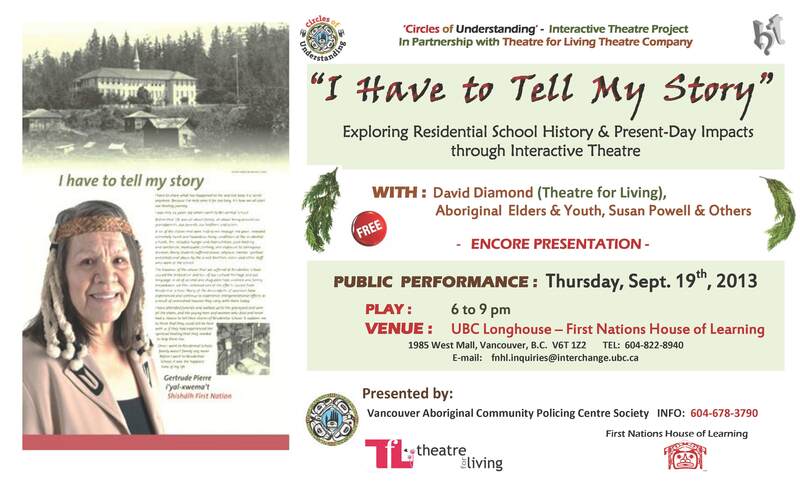 The performances were exceptionally well received and will be remounted as part of UBC’s contribution to the Truth and Reconciliations events in September. David is a 1975 BFA graduate of the University of Alberta. He was a founding member of Vancouver’s Theatre for Living (Headlines Theatre) (1981) and has been Artistic Director since 1984. David has directed over 500 community-specific projects on issues such as racism, civic engagement, violence, addiction, street youth, intergenerational conflict and homelessness. He has worked throughout Canada, the USA and Europe, as well as in Namibia, New Zealand, Australia, Brazil, Rwanda, Palestine and Singapore, and has pioneered the development of live, interactive Forum television and web casting. He is the originator of Theatre for Living, a merging of Augusto Boal’s Theatre of the Oppressed, and his own life-long interest in systems theory. Theatre for Living recognizes communities are complexly integrated living organisms and invites them to engage in constructive social change, moving from various forms of violence to respectful engagement. David is the recipient of numerous awards, including the City of Vancouver’s Cultural Harmony Award, the Jessie Richardson Award for Innovation in Theatre, an Honorary Doctorate from the University of the Fraser Valley and the Otto René Castillo Award for Political Theatre. In 2010 he was honoured to travel with the Governor General of Canada (Michaëlle Jean) as a Canadian Delegate in Africa. He is also a recipient of the Vancouver 2012 Mayor’s Arts Award for Community Engaged Art. Under David’s Artistic Direction Theatre for Living (Headlines Theatre) has been honoured with numerous Jessie Richardson award nominations as well as two awards for “Outstanding Production” and two for “Significant Artistic Achievement”; the Red Cross Power of Humanity Award; the Canadian Healthy Environment Award; MOSAIC’s Human Rights Award; and numerous recognitions for innovation in live, interactive community television broadcasting. David is the author of Theatre for Living: the art and science of community-based dialogue, which has a foreword by renowned systems theorist, Fritjof Capra and was honored with the American Alliance of Theatre and Education 2008 Distinguished Book Award. In 2012 the book was published in German by Ibidem under the title Theater zum Leben and is also currently being translated into Spanish.